Antenna Magus version 4.2 released! 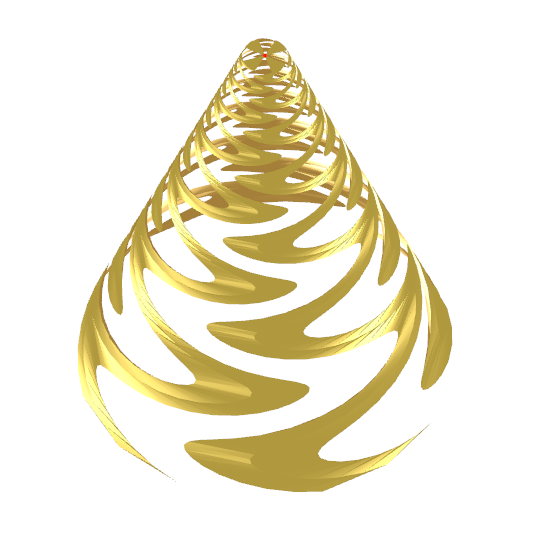 We are very pleased to announce a new release of Antenna Magus Version 4.2. This release boasts 4 new antennas and an article about commonly used coaxial RF connectors which contains useful FEKO and CST MICROWAVE STUDIO simulation models of each connector. 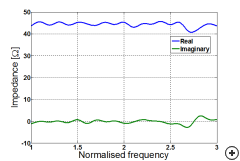 As 2012 draws to a close we look back at an exciting year where Antenna Magus has become an integral part of the design process of more antenna engineers, assisting in making intelligent antenna design and modelling choices. 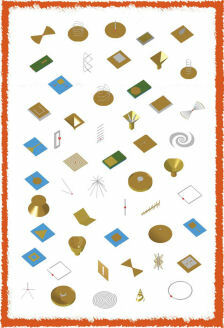 2013 is going to be an even more exciting year with lots of feature extensions and antenna additions planned. Summary of some useful RF coaxial connectors available in Antenna Magus. SMA Female PCB type connector. This 50 Ω SMA connector uses a PTFE (polytetrafluoroethylene) dielectric and offers excellent electrical performance from DC to 12.4 GHz (for flexible cables) and DC to 18 GHz (for semi-rigid cables). Above this frequency and up to 34 GHz, SMA-like 3.5 mm connectors are used - which can be mated to standard SMA connectors. SMA 2 hole female panel mount with extended PTFE. N-Type 4 hole panel mount Jack with extended dielectric. The N-type connector dates back to 1940 and was one of the first connectors capable of carrying microwave-frequency signals. The standard upper operating frequency is 11 GHz and some connectors are extended to operate at 18 GHz. 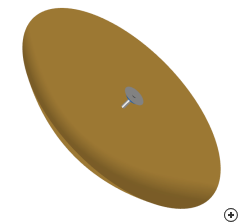 The above image shows an N-Type 4 hole panel mount Jack connector with extended dielectric, typically used to feed a cavity or waveguide. MMCX connectors were developed in the 1990s, and are similar, but smaller, than MCX connectors. These connectors are most commonly used in Wi-Fi PCMCIA cards as antenna connectors, or as external GPS antenna connectors on small devices. They use a snap-lock mechanism, allowing 360 ° rotation, usually with 50 Ω impedance and have good electrical performance from DC to 6 GHz. Antenna Magus 4.2 introduces 4 new antennas. The Axial choke horn with a dielectric lens is a popular reflector feed antenna, while the Offset-fed Gregorian and Cassegrain are practical and flexible reflector antennas with low blockage and compact size. The simple, robust "Egg-beater" antenna is ideal for circular polarised radiation in the UHF and VHF bands. It is also a great option for low-cost mobile satellite communication applications. 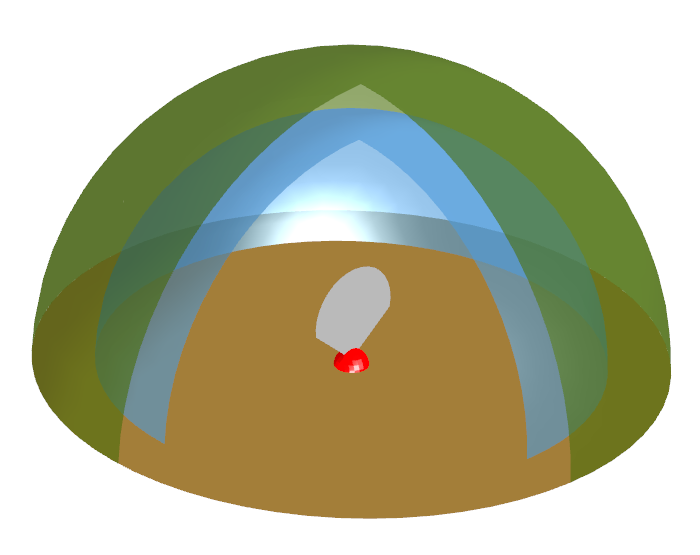 Image of the Splash plate reflector . 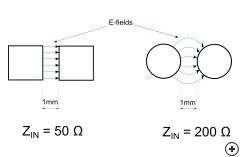 The splash plate feed uses backfire radiation to illuminate the dish, and the feeder waveguide doubles as a feed/support structure (see the image below for an illustration of the feed element). 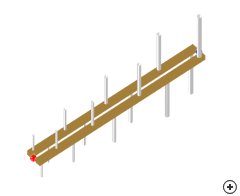 This is a compact reflector topology with the feed positioned close to the main reflector requiring no additional support struts. Another advantage is that the feed antenna can be fed from behind the main reflector, reducing unwanted aperture blockage. The Splash plate feed antenna used here is an intricate design consisting of a matching section inside the waveguide and dielectric lens which is designed with the feed plate for optimum dish illumination. 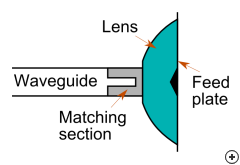 Illustration of the Splash plate feed element. 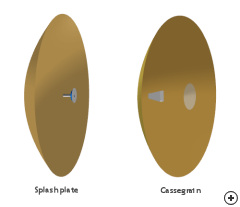 The Splash plate reflector can be compared with the Horn fed Cassegrain reflector already in Antenna Magus. 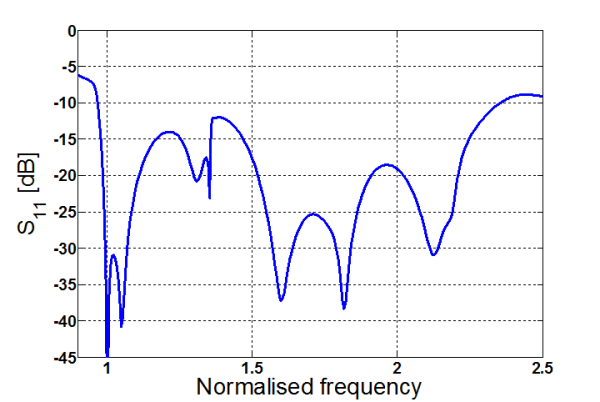 The following image shows one of each of these antennas designed for the same primary dish diameter (0.4m) and F/D of 0.3 at 30 GHz. 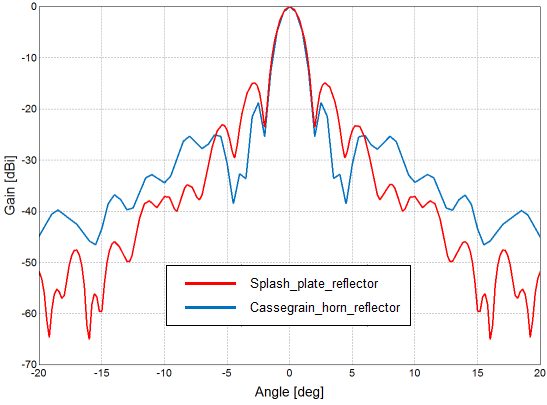 Note that the Cassgerain's feed horn intersects the primary reflector - Antenna Magus exports simulation models that include a small cut-out in the primary reflector to cater for this. 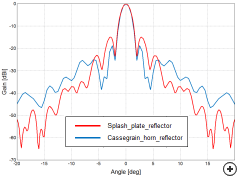 A Splash plate and Cassegrain reflector design with primary dish diameter of 0.4m, F/D of 0.3 at 30 GHz. 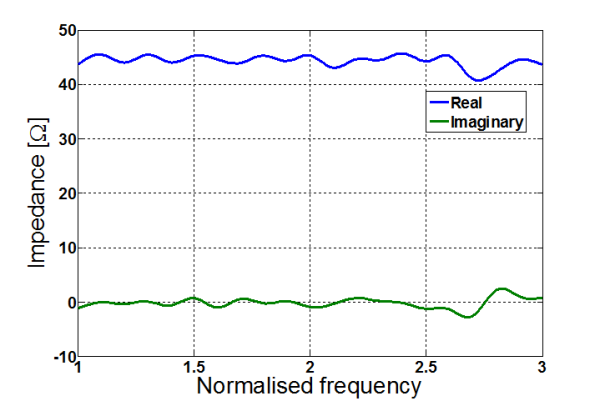 The graph below compares the radiation pattern results that were estimated in Antenna Magus. 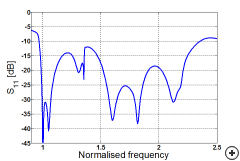 It is important to note that no struts are included in the Cassegrain analysis - these would introduce unwanted blockage, increase sidelobes and reduce performance in the actual antenna. The splash plate result shows better backlobe performance, but slightly higher sidelobes than the Cassegrain reflector - a small compromise to achieve a more compact and mechanically simpler design. 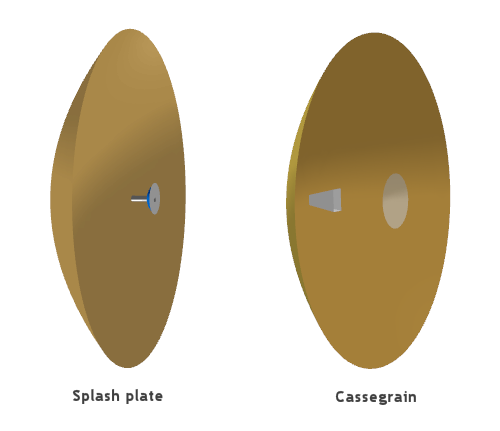 Normalised gain comparison between the Cassegrain and Splash plate reflectors, designed for similar primary reflector size and F/D. Image of the Dielectrically loaded disc monopole with radome cutout. 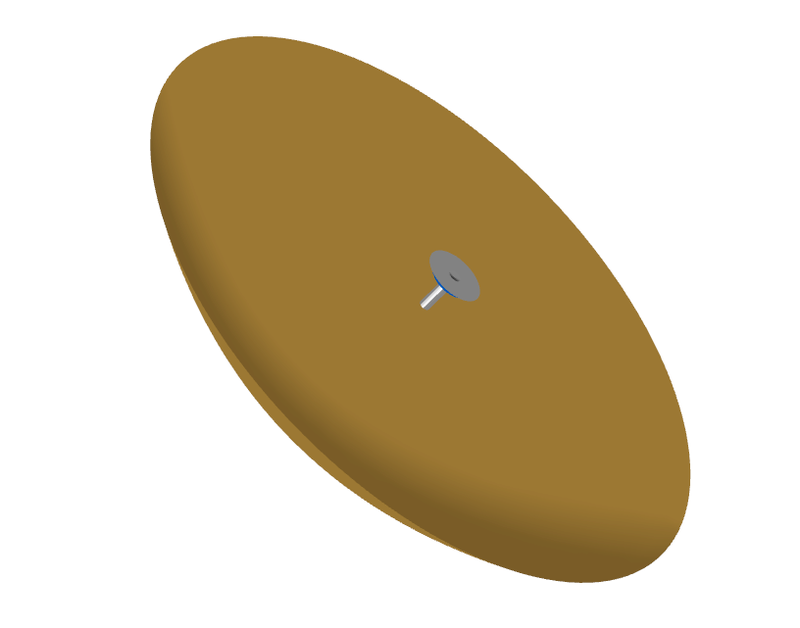 Disc monopoles are popular low cost antennas which are typically used in modern wireless communication systems requiring wideband performance with low to medium gain. 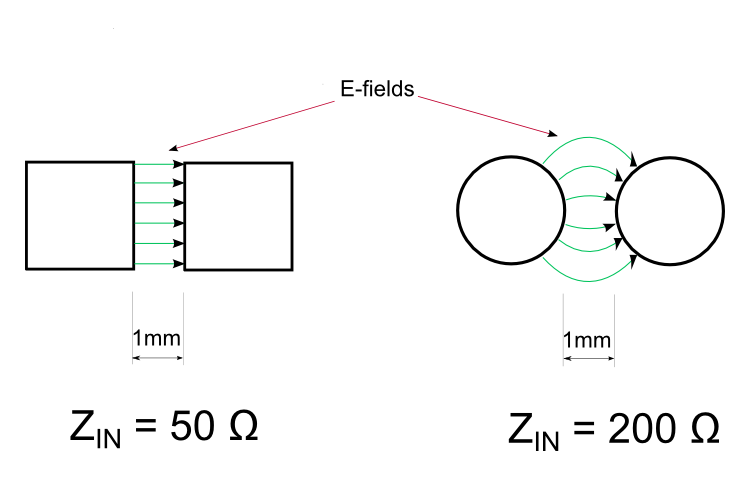 The Dielectrically loaded disc monopole has performance similar to that of a normal Circular disc monopole (CDM) with an almost 60% size reduction whilst maintaining almost 80% of the impedance bandwidth. 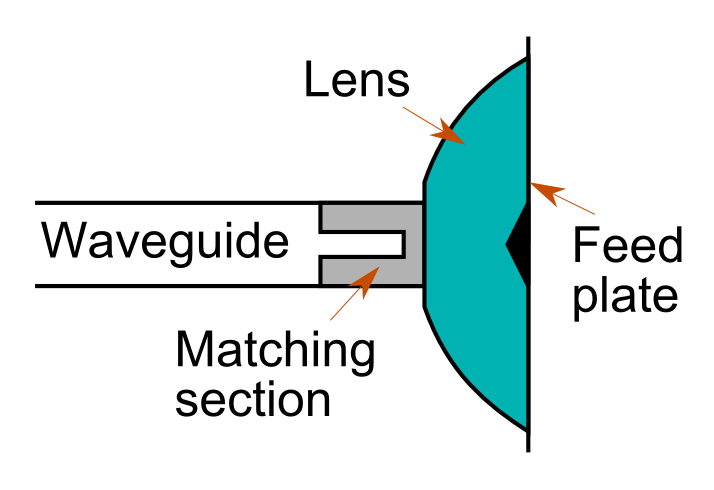 As shown in the above image, an extra dielectric layer is added to improve the match between the inner dielectric and free space. 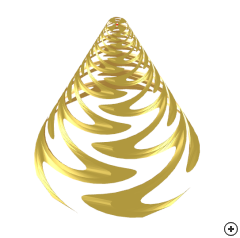 This outer layer has a thickness of λ/4 and relative permittivity of √εr_inner. The following graphs show typical performance of a Dielectrically loaded disc monopole designed with inner and outer dielectric materials, εr_inner = 9 and εr_outer = 3 respectively. Total gain patterns - fmin ,1.5fmin, 2fmin and 2.5fmin.